The validity of the relative percent concept for equating training intensity was investigated using the point of metabolic acidosis (anaerobic threshold) as the criterion variable. 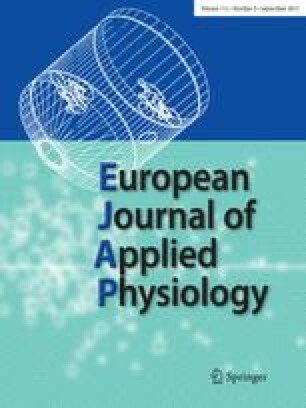 Percent oxygen uptake, heart rate and metabolic acidosis were determined at 60, 70, and 80% of max heart rate on a bicycle ergometer test (N=31). At 60 and 70% of max heart rate only one individual was definitely in metabolic acidosis. At 80% max heart rate 17 subjects were working at a level above the point of metabolic acidosis while 14 were working at or below this point. Thus, it was suggested that even if subjects are exercising at the same relative percent maximum HR, the metabolic stress using metabolic acidosis as the criterion is not constant across subjects. It was further shown that the regression of percent \(\dot V\)O2 max on percent max HR was a spurious one resulting in poor prediction of individual \(\dot V\)O2 values. The data presented suggest that the relative percent concept for equating exercise or subsequent training intensity needs careful re-evaluation.